During Billy Lange’s childhood on the Isle of Wight, he is entranced by Karin, the wild and elusive daughter of a German-Jewish baron who employs Billy’s parents. Years later, after the upheavals of World War I, the two children are reunited on the baron’s Frankfurt estate. Billy and Karin first bond over the popular Wild West stories of Karl May, and later over their passion for jazz and Berlin nightclubs. But they also come to share a fantasy of escape from the 1930s Germany that is rapidly darkening around them—escape to the high plains of Texas and New Mexico they’d read about as children. Against the backdrop of Hitler’s rise to power, their friendship deepens into a love affair with extraordinarily high stakes. 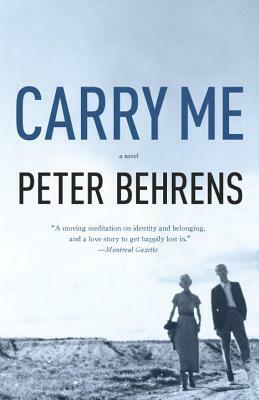 Brilliantly conceived and elegantly written, Peter Behrens’s Carry Me is both an epic love story and a lucid meditation on Europe’s violent twentieth century. PETER BEHRENS’s first novel, The Law of Dreams, won the Governor General’s Literary Award, Canada’s most prestigious book prize, and has been published in nine languages. The New York Times Book Review called his second novel, The O’Briens, “a major accomplishment.” He is the author of two collections of short stories, Night Driving and Travelling Light. His stories and essays have appeared in The Atlantic, The New York Times, and many anthologies. Awards he has received include a Wallace Stegner Fellowship in Creative Writing at Stanford University. A native of Montreal, he is currently a fellow at Harvard University’s Radcliffe Institute for Advanced Study.